If you’re going to do yet another VR headset, the least you can do is bring something new to table. For Alcatel, that means an all-in-on solution, doing away with the need for a tethered computer or handset. The Vision is a self-contained VR device. All the hardware you need is right there in the box. It’s not clear exactly what niche the company is trying to address here. Certainly it’s not intended to compete with top tier headsets like the Vive and Rift, but the proposed pricing of €499 to 599 ($557 to $668) here in Europe, it’s a heck of a lot pricier than the Gear VR. 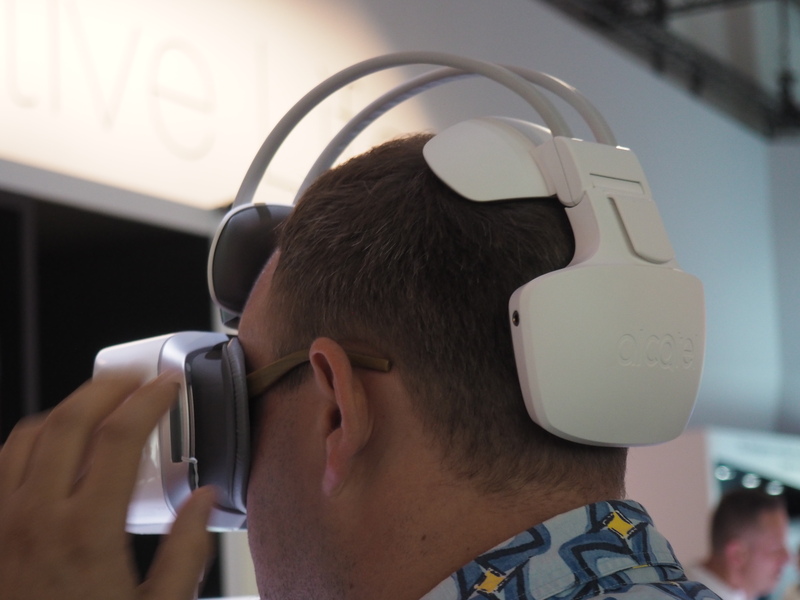 Perhaps Alcatel is banking on people who want a simple VR experience but don’t have a compatible (ie Android) handset? Whatever the case, the company’s going to have to look into ways to shave some Benjamins off the price tag if it really wants to earn that entry level badge. The other issue with the system is the problem every company has with a new platform: content. Though Alcatel says it’s work on it, with 50 games and twice that number of VR-ready videos by the time the headset hits the market before year’s end. The headset is actually pretty comfortable, if somewhat goofy, even by VR standards. The company has gone a little overboard with the padding, which extends fully over the head. One side of the device sports a touchpad and the other a set of volume buttons. Most of the menu selection occurs when the user focuses on items. The Android-based menu system should be fairly familiar to anyone who’s used Cardboard or Gear VR, while the optics definitely have “entry level” written all over them. The games on demo, too, were fairly rudimentary, though the company does have a few months to roll out the big guns there. Surely there will be some gems in amongst the 50, right? If Google Cardboard and Gear VR weren’t already going concerns, the Vision could be a compelling device. As it stands, however, Alcatel’s got an uphill battle on its hands here.